I was thinking recently about the fact that I’ve done a ton of recipes using wonton or egg roll wrappers, but not a single one of them has actually been an Asian recipe. How weird is that? I put an end that streak with these Chicken Egg Rolls and I’m really happy I did. They’re only 113 calories or 2 Weight Watchers SmartPoints each and they’re surprisingly filling (probably because they’re packed with protein from the chicken). These make a great appetizer or snack but you could also easily have a few as a main course for lunch or dinner. I absolutely love Hoisin sauce (kind of like a Chinese barbecue sauce), and it gives the egg roll filling a slightly sweet, tangy flavor. The veggies add freshness and crunch and each roll is bursting with a hearty amount of chicken. Baking the egg rolls gives the wrappers a nice crispness without leaving them oily like their fried counterparts. 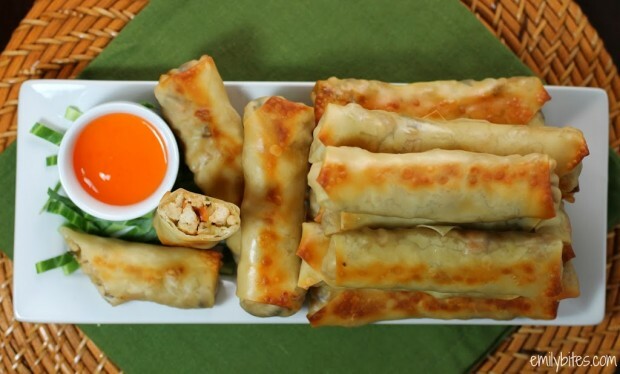 Serve these Chicken Egg Rolls with the dipping sauce of your choice and these are sure to be a crowd pleaser! In a large skillet or sauté pan, bring the sesame and olive oils to medium heat. Add the minced garlic and ginger and cook for 1-2 minutes until fragrant. 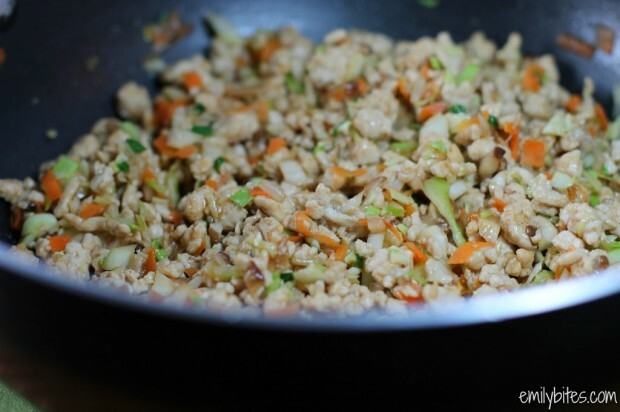 Add the ground chicken and break it up small with a spoon until cooked through. Add the mushrooms, carrots and bean sprouts and cook for another 1-3 minutes until the mushrooms are just wilted. Remove the pan from the heat and add the cabbage, scallions and Hoisin sauce. Stir together until thoroughly combined and let cool for 5 minutes or so. Pour some water into a small dish and set aside. On a flat surface, place an egg roll wrapper, corner facing toward you (like a diamond) and put ¼ cup of the chicken mixture on the center of the wrapper. Spread the mixture in a horizontal line from the left corner to the right corner of the wonton wrapper, leaving ½ inch or so of space on each side. Fold the bottom corner closest to you up over the ingredients and give it a 90 degree roll. Fold the side corners in and tuck them as you give the filled section another 90 degree roll. Dip your finger in the dish or reserved water and lightly wet the edges of the remaining top corner of the wrapper. Finish rolling the filled egg roll over the wet corner so that it adheres. Place wrapped egg roll onto the prepared baking sheet. Repeat with remaining ingredients. When all of the egg rolls are wrapped and on the baking sheets, mist the tops with cooking spray. Bake for 14-15 minutes, flipping once halfway through, until the wrappers are golden brown. Serve with your favorite dipping sauce. Wow Emily! Another winner! Can’t wait to try these! Andie on canyoustayfordinner.com has non-Asian chicken rolls. What she does is use a wire rack on the cookie sheet so there’s no turning, just an idea for people. These look yummy and I’m going to have to try them soon! Love this idea! Thanks ajchaney89! I’m going to try this! Hi, you mention scallions in recipe but not in the ingredient list. How much did you use?? Can’t wait to try! I may or may not have just squealed…I cannot wait to make these! I LOVE Chinese food but never allow myself to get it since it’s full of salt & calories. This recipe sounds (and looks) amazing. I made these last night and they were a hit with my family and super delicious. I like them even better today cold and the problem is I can’t stop eating them. Thank goodness they are only 113 calories each. I used 1/2 cup of scallions as I noticed that they weren’t on the ingredients list too. These are in the oven right now! I love Chinese food but don’t eat it very often because the things I like are mostly fried (egg rolls and dumplings mostly) Can’t wait for these to come out of the oven! So excited that they are only 3 points plus!! I am hoping to have a couple left over to take for lunch tomorrow too but not sure since I have 2 sons who are BIG Chinese food lovers LOL! I made these about a week ago and loved them but really felt like they needed double the cabbage. It’s practically non-existent in the rolls. The flavors were very good. I only added cabbage and doubled the carrots because I didn’t have the sprouts or mushrooms. I have never made egg rolls but they rolled up quite nicely. I will make again and double the cabbage. Thanks!! Delicious! I don’t like mushrooms or bean sprouts, so I left those out and quadrupled the cabbage and carrots (so 4c cabbage and 1c carrots). Ended up making 17 egg rolls and they were AMAZING! I made a simple teriyaki sauce to dip them in by simmering 2TB cornstarch with 1c store-bought teriyaki sauce. These will be perfect for my lunches this week. 🙂 Thanks Em! These came out fantastic! Mine did not come out nearly as neat and pretty as the picture but regardless they wer very yummy! Thanks so much for all of the wonderful recipes! I made these for a party a few weeks back and they were a HUGE hit! People could not believe they were only 3 points+ for an entire roll! I will definitely make these again. Thank you for the recipe!! So delicious…thank you so much!! I couldn’t find them on mfp for some reason? Happy to have found this excellent recipe source. where do I find the egg roll wrappers? This is very informative. Delicious and good for health. Thank you. 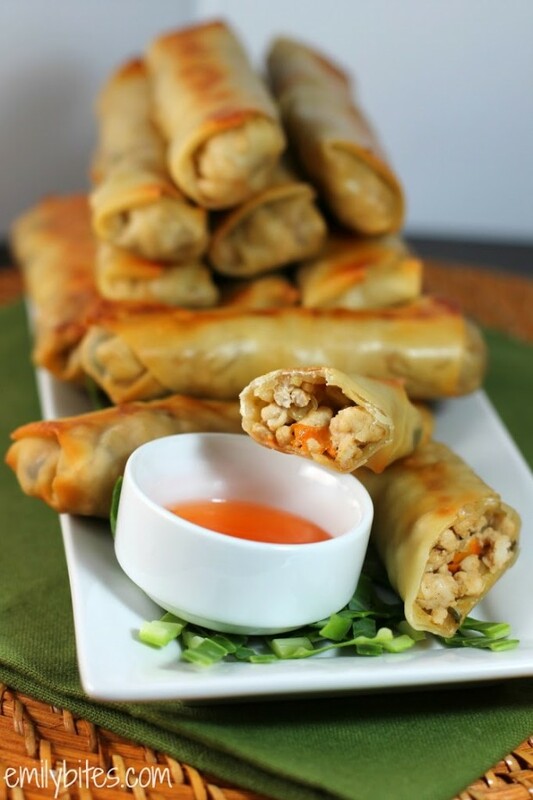 These Chicken Egg Rolls look delicious, but I need to know the sodium content before making them. Thank you. Jusr had these and they were fabulous. I love to cook asian food and was thrilled to find an asian section on your website. Just started WW on Thursday and these help with the asian craving. This is the first recipe of yours I have tried. Planning on making Slow Cooker Thai Peanut Chicken to have after my meeting Wed. night.